Friday evening forecast with Mike Nelson. 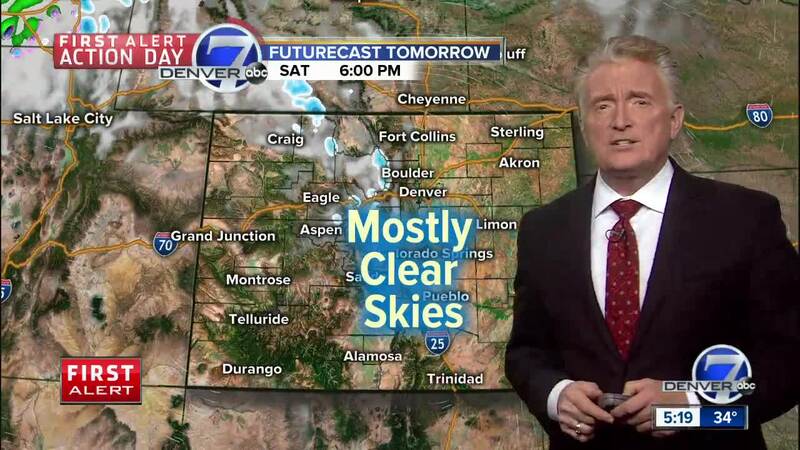 DENVER — A strong storm system has brought wind and snow to most of Colorado. The mountains bore the brunt from the storm with 10 to 18 inches of fresh powder - just in time for the long weekend! Denver and the eastern plains picked up an inch or two in most areas, but several bands of heavier snow hit parts of the I-25 Corridor with 3 to 5 inches of snow in Lakewood and along the Palmer Divide. The snow will end tonight with clearing skies and colder temperatures. Lows will dip to 5 below to 5 above in the mountains with teens to low 20s on the plains. Be alert for icy spots and stretches on the roads through mid-morning on Saturday for lower elevations and all day in the mountains. Saturday will be sunny and milder with highs in the 40s to low 50s for lower elevations and in the upper 20s to mid-30s in the mountains. Clouds will increase on Sunday ahead of the next storm system. Sunday will be dry, aside from a few mountain snow-showers. Highs will be in the 50s for Denver and the eastern plains, with 30s in the mountains. Another storm will arrive Monday afternoon and early Tuesday with more heavy mountain snow and a few inches of snow in Denver. Colder weather will follow the storm with highs in the 30s statewide on Tuesday.